Cook and stir first 4 ingredients in half the dressing in large skillet on medium heat 8 to 10 min. or just until vegetables are crisp-tender. Add remaining dressing; cook 2 to 3 min. or until heated through, stirring occasionally. Use kitchen shears to quickly and easily snip off the ends of the green beans. Substitute your favorite nuts for cashews. 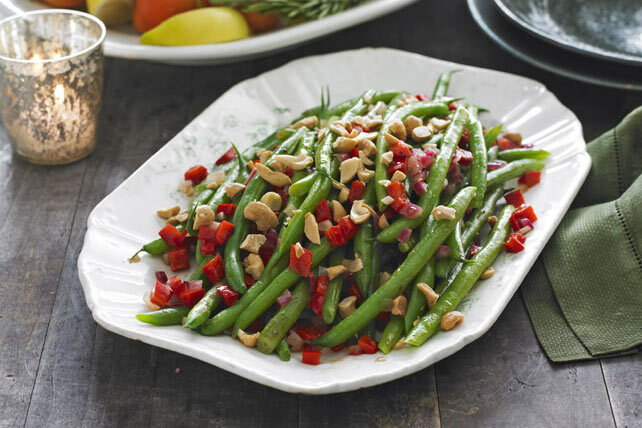 The red pepper in this crunchy bean combination provides a good source of vitamin C.